Button-Up Neck Warmer and Liesl, blocking. I hadn’t planned on blocking either of these yesterday, but I got home before Matt and had some time to myself, so I washed and blocked the Button-Up Neck Warmer and Liesl. I also got some great buttons yesterday at Banasch’s. 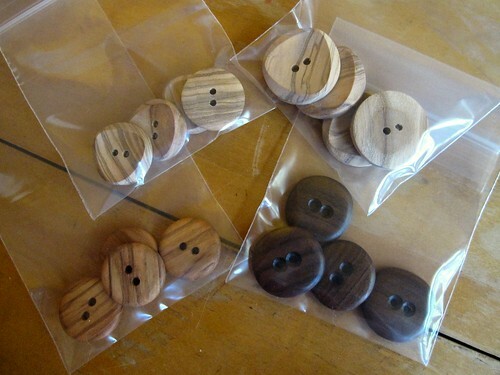 I think I might be slightly obsessed with wooden buttons. I can’t help it! They call to me and I want to put them on every project I make lately. Back on the needles, Open Flame stockinette sock. I have to admit that some of the pictures I take and post here aren’t from my regular point and shoot camera. Many of them, like the one above, have come from my iPhone 3Gs. It actually has a great camera and I’ve taken some good pictures with it. This one is probably my favorite. So crisp and clear as if I’d taken it with my camera using the macro setting. 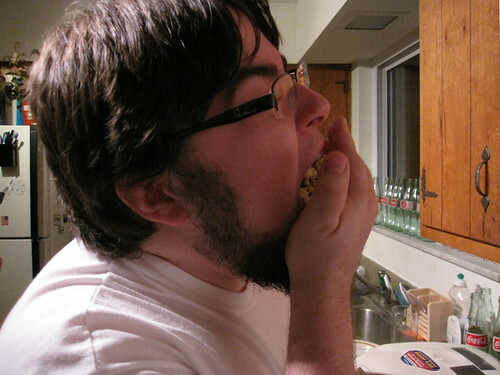 I love having a camera with me at any given time and it’s great that this one takes such good pictures! Anyhow… I just wanted to share that since I’ve been rather impressed by it. Have you seen the new issue of Twist Collective that came out yesterday? 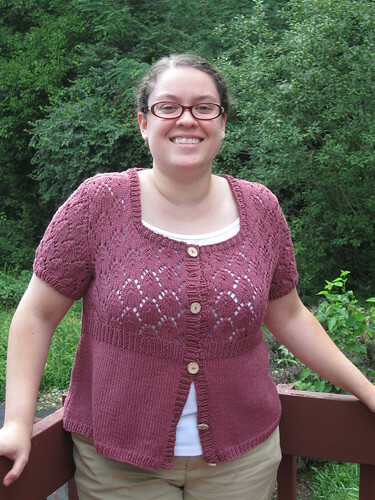 There’s a lot of great patterns in there as always, but the one that has captured my attention is the Vine Yoke Cardigan by Ysolda Teague. It’s knit side to side, in one piece, and comes in a wide range of sizes. I haven’t knit a sweater in this manner before, but something I have wanted to try. I just haven’t seen any patterns knit this way that have called to me like this one is! I had to restrain myself from winding yarn and starting it yesterday. 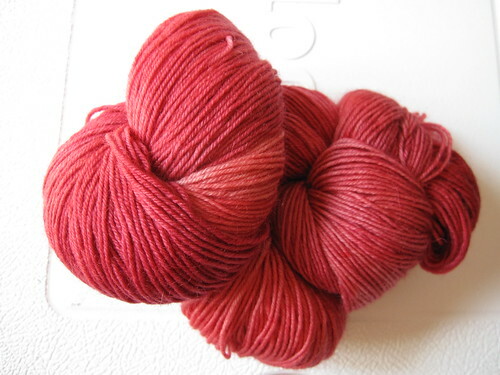 I plan on using Brooks Farm Mas-Acero (55% wool, 30% Silk, 15% viscose) that I have in my stash. 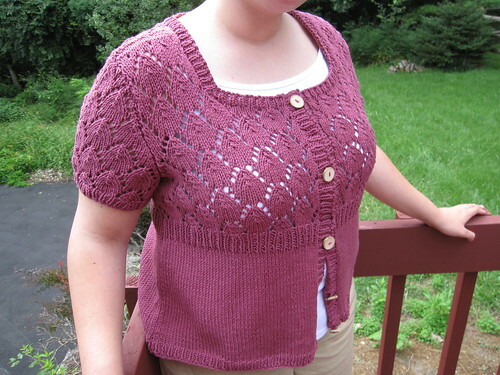 I was thinking of doing the February Lady Sweater with it, but my interest in knitting that has dwindled. Eventually I’m sure I will, just not right now. What’s your favorite kind of thing to knit? What patterns are calling to you this time of year? I’d love to know! This weekend I made myself a niddy noddy for under $2! I’ve been needing one for a while now, but I didn’t really want to spend a whole lot of money on one right now. 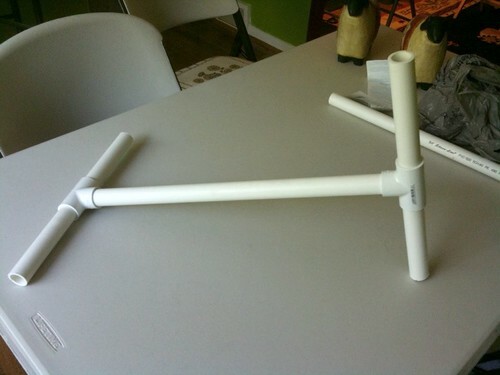 I looked up some instructions on what I’d need to make a PVC one. It seemed simple enough, so when we were at Lowe’s this weekend, I picked up what I needed to make one. 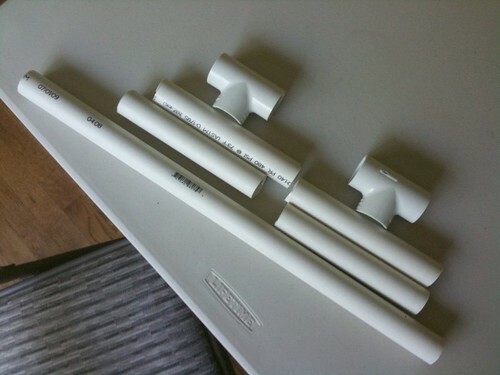 Directions said to get a 4 to 5 foot 1/2″ PVC pipe, but they were out in the 5 foot size and I didn’t want over 6 feet of pipe that I didn’t need, so I got a 5 foot 3/4″ pipe instead. There was a pipe cutting station, so I went over and waited for someone to cut my PVC pipe. The guy came over and said “This is only for metal pipes *grumble grumble*” and took my pipe. I was confused and ready to take it back and find whatever tool I needed to cut it, but he went and got some tool and cut it for me anyhow. 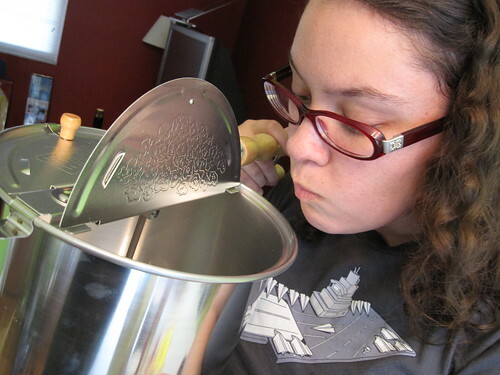 I had him cut one 18″ piece and four 6″ pieces, which left an additional 19″ piece I have no idea what I’ll do with. After that I found two “T” pieces that fit the pipe. The pipe was $1.23 and the “T” pieces were $0.33 each for a total of $1.89 to make the niddy noddy! I got home and pieced it all together, which hardly took any time at all. There’s no need to glue anything in place since you want it to be able to twist. It’s easy to assemble or disassemble for storage. I still need to sandpaper the ends, but I need to find some sandpaper first (we probably have some, I just haven’t looked). 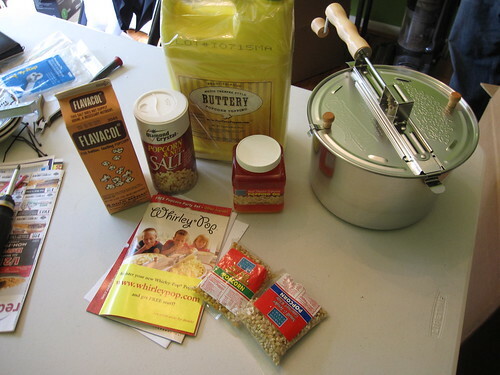 Pretty easy project and cheap, too! We really went to Lowe’s to look at and possibly buy a grill. We did manage to find one we liked in our price range. We got it home, but weren’t able to put it together right away because we had a birthday party to go to. 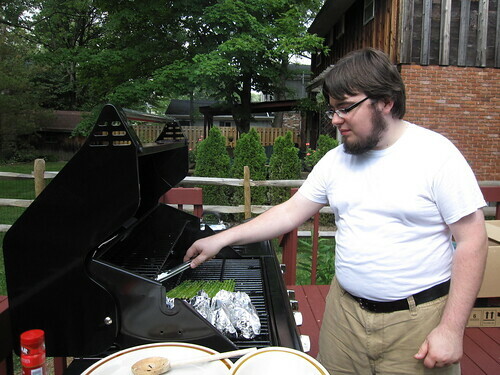 After that, Matt’s brother came over and they put the grill together. The instructions said it would take 50 minutes, but it took 3 hours. I don’t know how anyone could have put the thing together in 50 minutes! Matt and his brother putting the grill together. 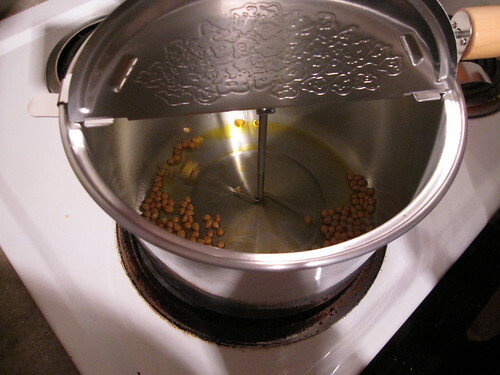 By the time it was put together, it was dark out and we found that we didn’t have a metal spatula to use the grill with! Instead of making the burgers on the grill, we ended up making them in the kitchen. The next morning, though, we made breakfast on the grill: turkey bacon, eggs (in a skillet on the side burner), and toast. It was pretty good! For lunch/early dinner, we invited Karen and Than over and made salmon, thyme marinated asparagus, and wild rice. I think it turned out pretty good! 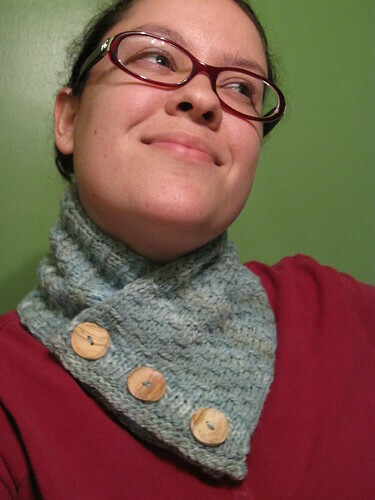 I was all jazzed that I finished something and pulled out my Button Up Neck Warmer hoping I could finish that, too. Sunday, I did! 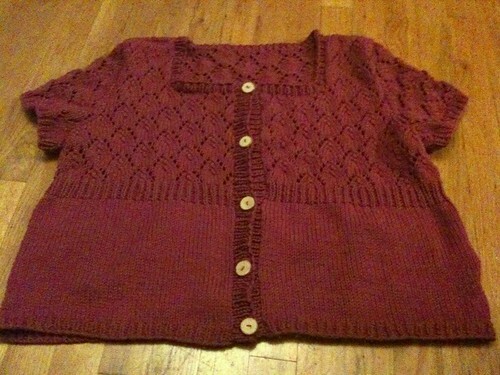 I need to wash and block it and add buttons, but I love how it turned out. It’s going to be nice and warm this winter! Since I finished Liesl, I’ve brought Starlight back out. 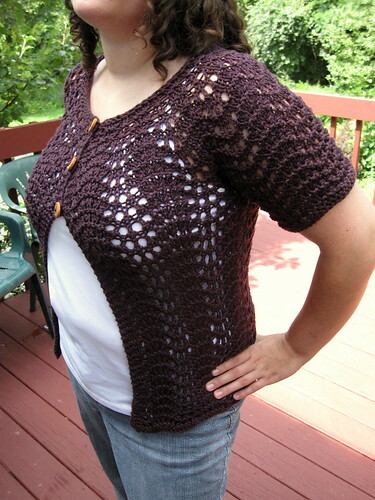 I have 2 months before Rhinebeck and my goal is to get this done by then! Think I can do it? 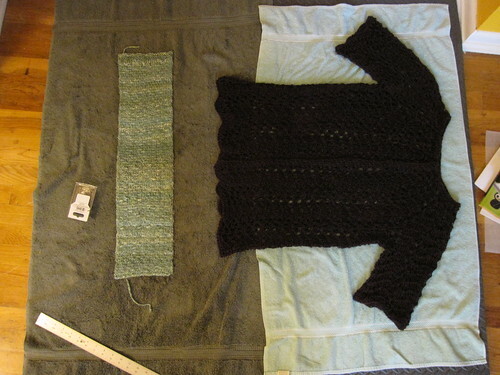 I’m nearly to the arm shaping of the first front piece, then I have to knit the other front piece and the sleeves. 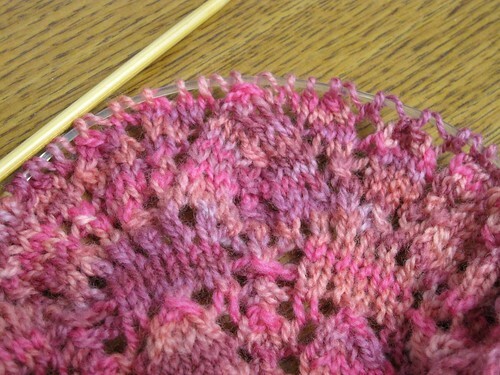 Still working on the 4th clue for the Secret Garden shawl. I have 2 more repeats before I move on to clue 5 (final clue), which will make the shawl jump from about 400 stitches now to almost 800! If I think that each row takes a while now, I’m a little scared to see how long THOSE rows will take! It’s “FO Friday!” Well today it is. 🙂 I finally have some pictures to share of Hey Teach! 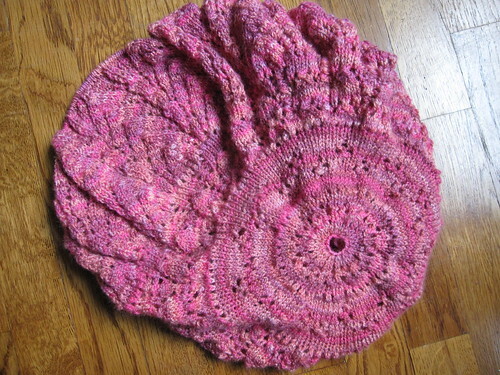 Notes: I knit this twice. First time it was way too big. Second time it came out just the right size. I get some gaping in between the buttons, so I think I’ll sew on some snaps to keep it closed. I thought about ripping out the button band and adding more buttons, but I don’t think I’d like the way it looks with additional buttons. The fit is great and I’m really pleased with the overall results! I finished thins about 2 weeks ago now. The button band was kind of wonky, though, so I wanted to re-block it before I took pictures. I’m glad I did! 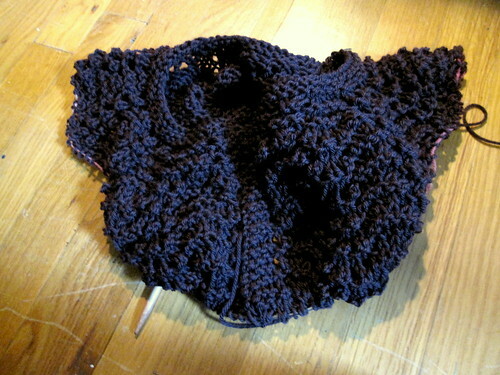 Looks much better now and I was able to add a little more length to it by re-blocking. 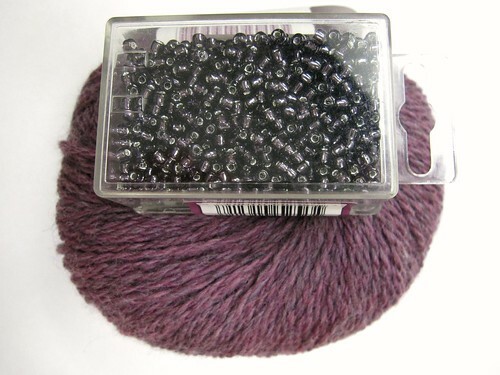 This week new yarn and beads arrived. I don’t have pictures of all of it yet, but I wanted to share the yarn and beads for the next two shawls I’ll be working on. Have you seen the new Zypher Acrylic needles from Knit Picks? 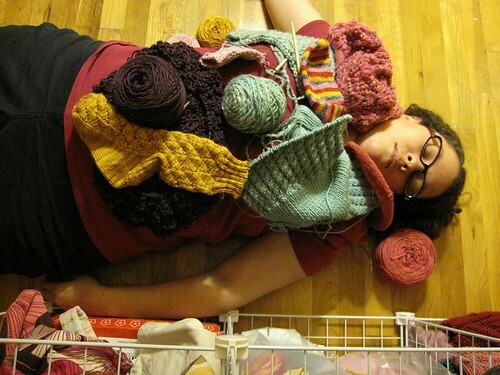 Recently a few in my knitting group got together and did a big Knit Picks order (yay free shipping!) and Karen got a set of US 4 tips since she already has the nickel-plated interchangeable set and we were both interested in trying them out. I’d heard a lot of good things before trying them. Last night I got to try them and I have to say that I’m not a fan at all. 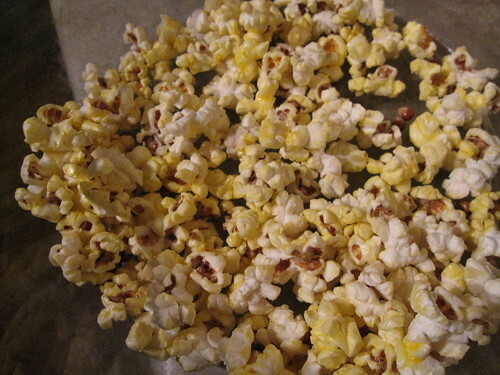 The best way that I can describe them is that they feel squeaky in my hands and sticky. 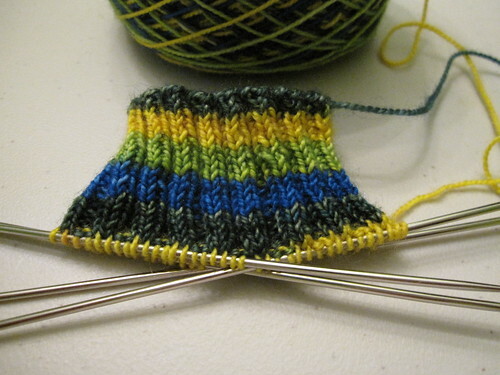 I was knitting with Knit Picks Stroll sock yarn and while it felt quite soft in the skein and knitted up, it felt awful to knit with on the Zypher needles. The yarn actually felt like Red Heart while knitting it on these needles (not that there’s anything wrong with Red Heart and I use it myself, but if the yarn isn’t Red Heart and is a soft wool sock yarn, it shouldn’t feel like that while knitting). I was rather disappointed by them. In fact, there were a lot of us at knit night that tried them and everyone was saying the same thing: they’re sticky, they squeek, and this lovely soft wool feels like Red Heart when you knit with these needles. After having a chance to knit with them, I don’t think I’ll be buying a set for myself. 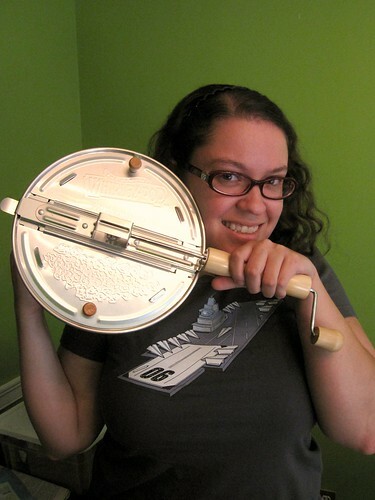 I still want a set of the nickel-plated interchangeable, though! 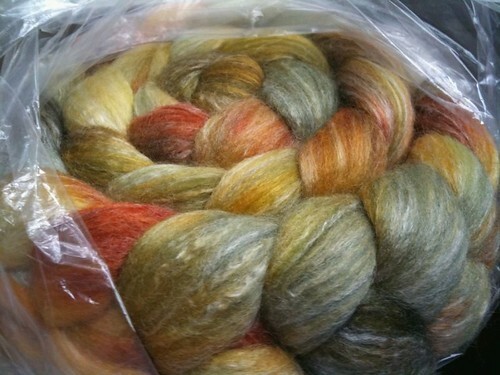 Earlier this week, I received my All Spun Up Spin-a-long fiber for August and September. It’s 50% merino/25%silk/25%bamboo and feels really soft. I can’t wait to start spinning it! When you order, you don’t know the color, so I knew I was taking my chances when I ordered 8 oz worth. 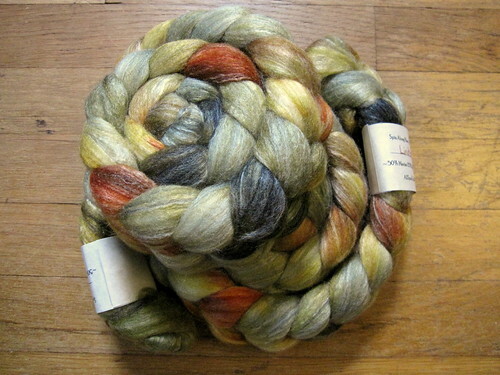 I’ve received some beautiful rovings from her Etsy shop, so I felt pretty sure that whatever the colors ended up being, I’d probably like them. I surely wasn’t disapointed. Not normally colors I’d pick first for myself, but very pretty. I think the color is closer to the previous picture, but here’s both 4 oz rovings. I don’t think I’ve mentioned it here before, but I do something that some knitters might think is crazy: I knit and read at the same time. I haven’t really admitted this publicly because I’ve heard knitters who also like to read say that they’d never do both at the same time. If I have a simple project, I’m able to prop the book open and read while knitting. 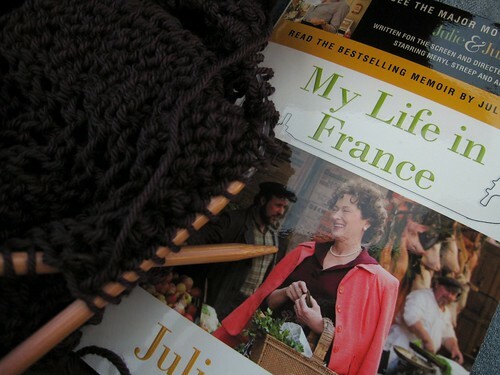 Right now I’m reading My Life in France by Julia Child. 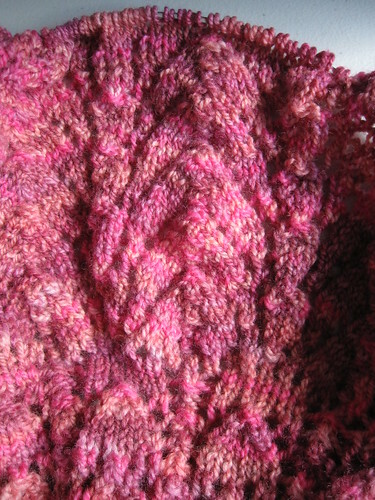 I admit it: I read AND knit… yes, at the same time! I’m not very familiar with Julia Child, but I’ve been meaning to get to know her for some time. When I was at Costco last weekend, I saw this book there and decided there’s no time like now! I’ve been reading this book and knitting Liesl at lunch this week. Speaking of Liesl, I don’t have an updated picture, but it’s nearly done! 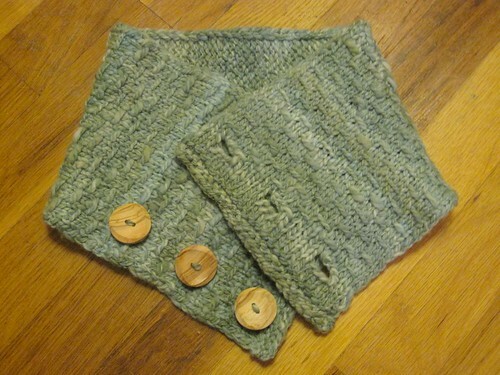 I probably have another inch or to until I’m at the bottom, then I’ll knit the sleeves. I haven’t really decided on the length of the sleeves. I was thinking short sleeves, but I’m leaning toward 3/4 length now. It all depends on how much yarn I have. I think I should have enough for 3/4 sleeves since I haven’t even started on the 4th skein yet and it’s unlikely I’ll need to before I finish the body. Liesl has been the only project I’ve done much work on this week. I’m just really enjoying knitting it and even have plans to make a second one after this! Ever get the feeling like you’re buried in WIPs? That’s NINE projects in the works! 3 pairs of socks, 2 sweaters, 2 shawls, a neck warmer and a scarf. 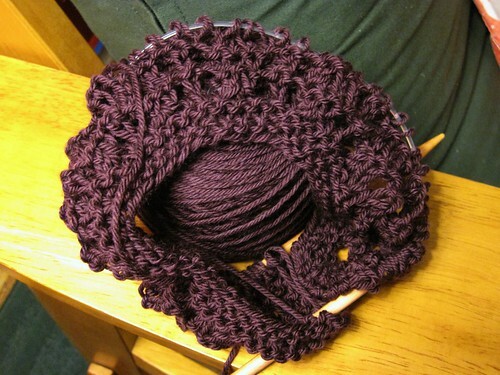 The Malabrigo scarf is a long term project. 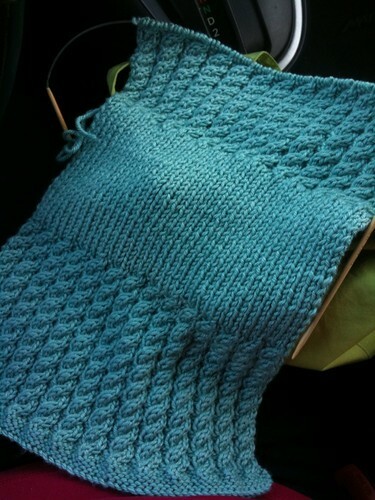 It’s a garter stitch scarf that I work on whenever I feel like it. Just something to work on when I just want to knit without thinking. The Nanner socks are likely to get frogged as I’ve lost all desire to finish them, but I’m letting them hang around to see if the desire to knit them comes back. The rest, I’m pretty actively working on. After realizing how many projects I had going on I’m feeling a bit like I’ve got too much, so I’ve moved a few things into “hibernating” status until other things get finished. Even though I had 7 projects on the needles, I started 2 new ones last week. 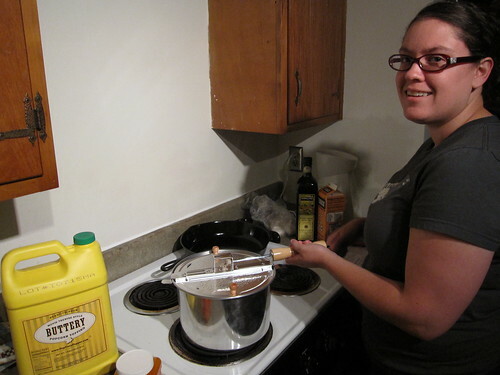 I mentioned in my last post that I started Liesl and it’s moving right along. 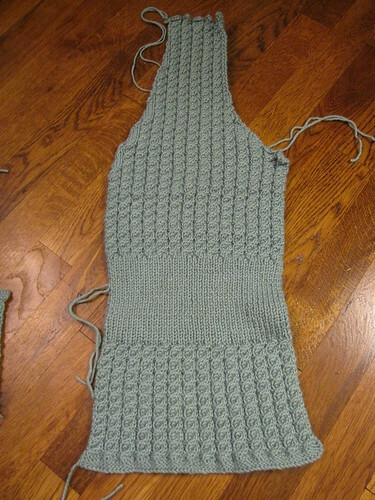 I’m probably about halfway done with the body and have already split off the sleeves. 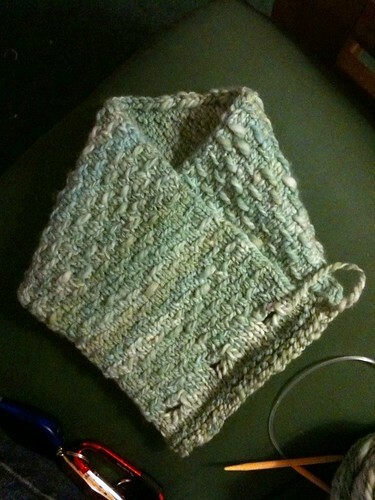 This has turned out to be a pretty quick knit after a rocky start that involved a lot of frogging. I didn’t like the neckline the way I initially worked it, so I ripped it out and did the lower neckline (did the high neckline when I first started) and I like it a lot better. The other project I started last week was Ishbel. I started this on Friday. I think I might have been in a “I’m bored with these projects, I need something new!” mood last week. 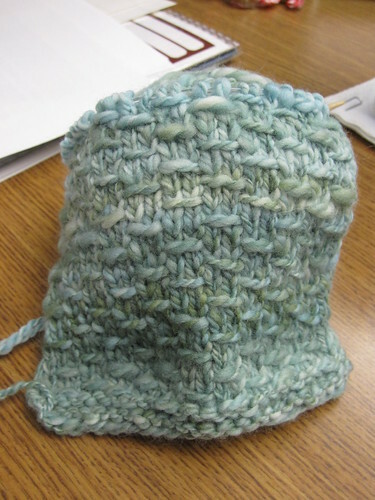 This is a pretty easy knit so far. Great for watching TV or knitting in the car (or while going through Costco while your significant other pushes the cart). I’m really loving the yarn! 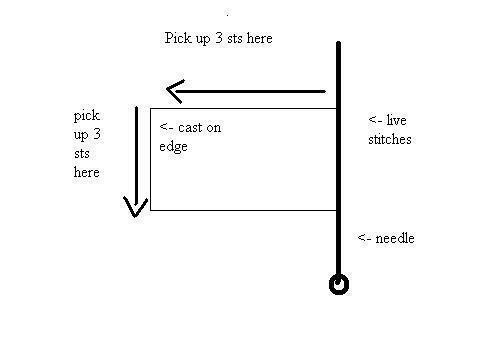 This is what it will look like when you’re ready to pick up the stitches on the side edge and cast on edge. 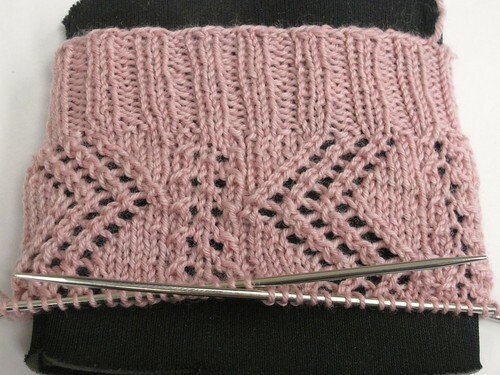 Not long ago, I came across the Knitting Purls/Knit-a-While Cuff-Down Smack-Down. Right away I knew I wanted to design something. Didn’t take long for me to start having some ideas. I wound up some yarn and kept it near my desk as a reminder. I let the ideas simmer in the background until yesterday when I finally charted up the pattern I had in my head. 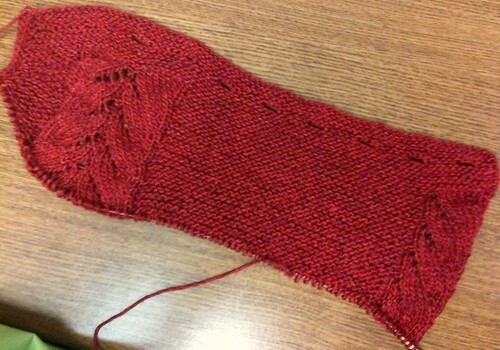 Tuesday I cast on and knit the cuff of the sock and Wednesday I began the pattern. I’ve done a little over one chart repeat so far and I like how it’s turning out! What do you think of it? I’m already trying to think up names. Plenty of time to decide on that, though. 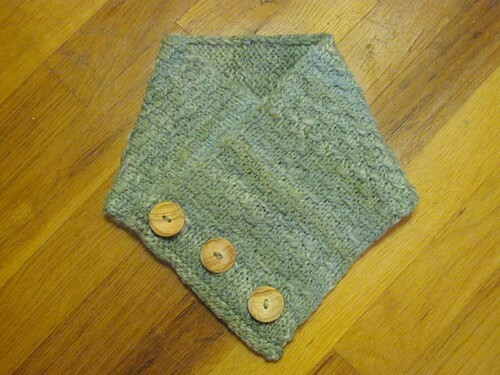 I’ve been working on my Button Up neck warmer, too. It’s moving right along and it’s been growing pretty quickly when I actually work on it. Guessing that I’m about 1/3 of the way done. 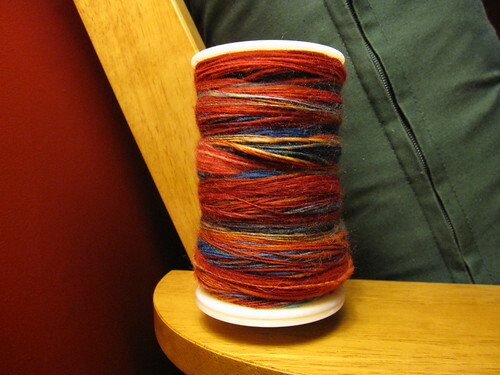 After a few days of not spinning, I started the second bobbin of the Scarlet Macaw fiber last night. Didn’t do a whole lot, but that’s because something new was calling me. 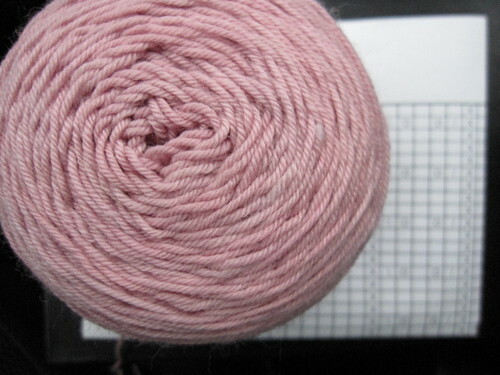 I decided I wanted to knit Liesl and I had 4 skeins of Louet Gems worsted in my stash without a project in mind. I love the color of the Louet Gems and I’ve been wanting to make this sweater for a while, so yesterday it was all I could think about after I’d decided I wanted to make it. 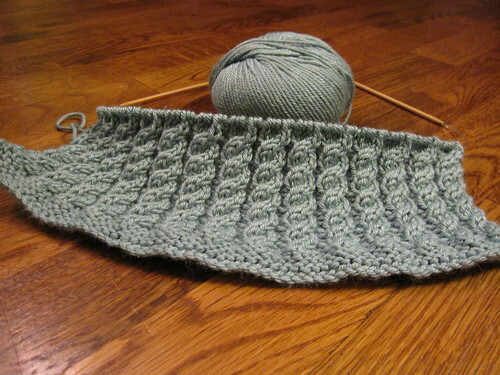 I knit a swatch and while it was blocking, I went ahead and cast on. Might have been a dangerous thing to do, but this morning I found that my swatch was dry and the gauge was perfect. 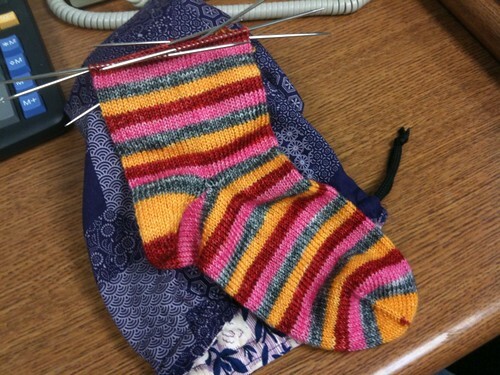 I’m using US 10.5 needles, so it’s going pretty quickly. 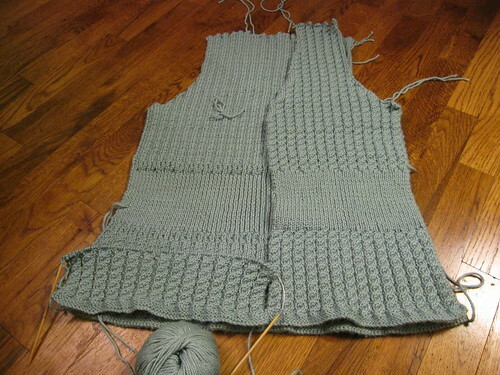 Few more rows and I’m already to the sleeves! Yesterday I received the August shipment from The Yarn Bearer’s Sock Club. This is the Nightmares Club and this month’s theme was Blood & Gore. It’s semi-solid red and I love it! Another project I’ve been looking at is the Ishbel shawl, so immediately I thought this would be perfect for it. 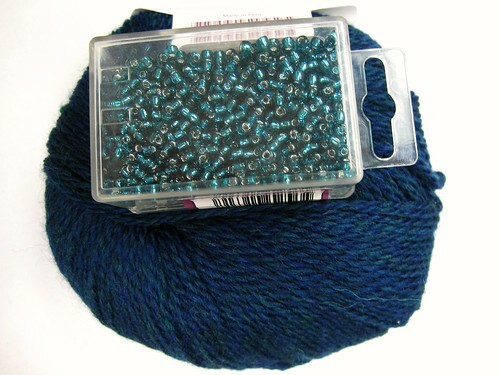 I have 500 yards to work with, which should give me a decent sized shawl. The weekend is nearly upon us! It’s been a busy week. Tomorrow I’m going to head down to MainStrasse in the afternoon for the World’s Longest Yardsale with some knitter friends. I’ll probably be looking for shelving or other furniture for our house. Should be fun! It will probably be hot, too, since it’s supposed to get up to 90 degrees tomorrow, which hasn’t happened since JUNE! It’s been a fairly cool and rainy summer this year. Any fun plans this weekend? Last week, my TLE Anniversary Kit arrived. 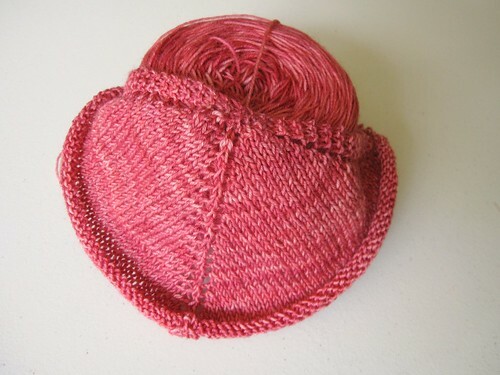 I don’t know if I’ll use the pattern with this yarn, but I do like both. The colors of the yarn are even better in person then they were on the website. Sometimes, pictures just don’t do something justice! 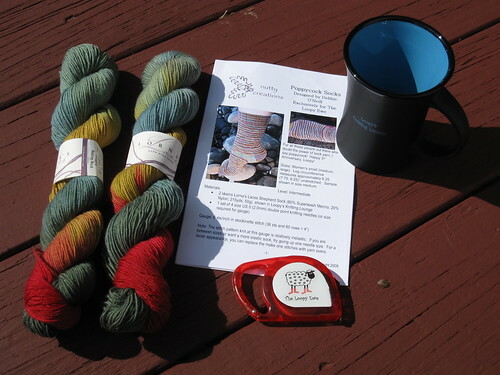 The kit came with 2 skeins of Lorna’s Laces, a TLE mug, sock pattern, and tape measure. This weekend felt a little busy, but not in the “running around everywhere” busy way that it had been feeling. It was busy in a “let’s get all this stuff done around the house and have people over” way. 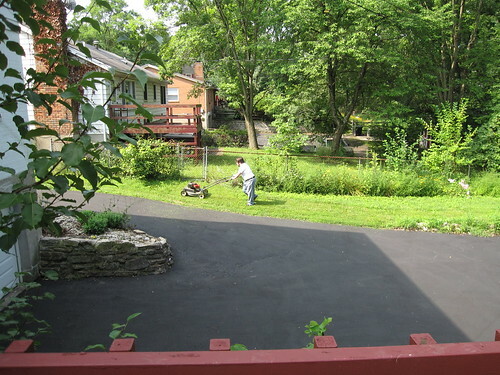 On Saturday, we got up fairly early and Matt mowed the lawn. I was the “helper” that got to sit and knit until he needed me to clear some branches that he didn’t want to mow over and sweep the grass off the sidewalk and driveway. It worked out well and didn’t seem to take too long to do. After that we spent some time setting up the rest of the game systems, unpacking boxes, and moving some stuff to the basement. Saturday evening we went to dinner with my family for my dad’s birthday (his birthday was Friday). We went to a Mexican restaurant and it was yummy. I swear I could eat Mexican food every day for the rest of my life and be fine with it! Sunday we were up fairly early again and finished unpacking and moving stuff around. We set up the shelf in the kitchen Saturday night, so I finally filled that with the rest of our kitchen stuff that doesn’t fit in the cabinets. Very glad that’s done with! I think seeing all the boxes around was getting me down a bit. It’s so nice to not see these piles of boxes everywhere anymore. Sunday afternoon, we had invited a bunch of people over for a potluck/game thing. Karen, Than, Sarah S., Jessy, Brian, and Alita were able to make it and Lisa stopped by briefly and got the grand tour of the house. 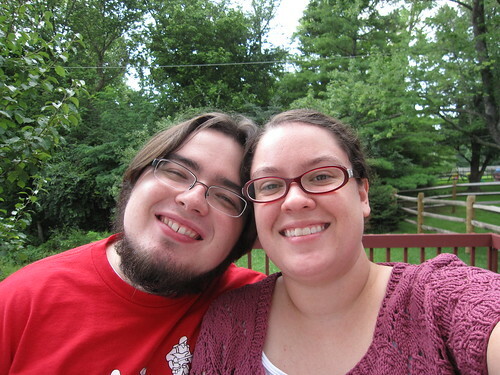 We ate good food and played Trivial Pursuit and Rock Band. I forgot to take pictures while everyone was there, though! I didn’t think about it until later, after Jessy, Brian and Sarah S. had left. 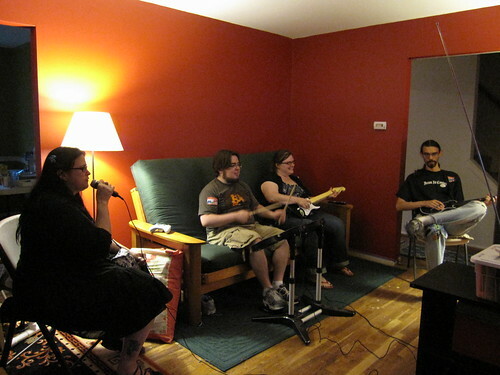 I did get a picture of Karen, Than, Alita and Matt playing Rock Band, though! We’ll definitely need to do something like this again. It was a lot of fun! Proof Hey Teach is DONE. 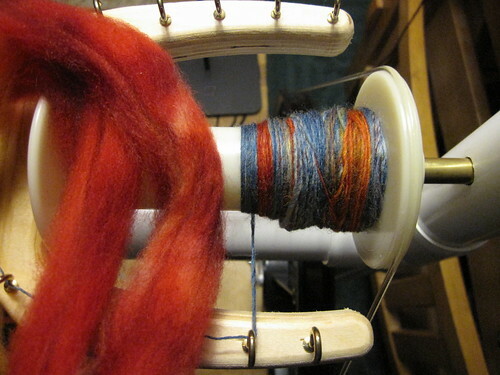 Last night I finished up the first bobbin of the Scarlet Macaw I’m spinning up. I probably have over half of it left to go, but I really like how it’s turning out. 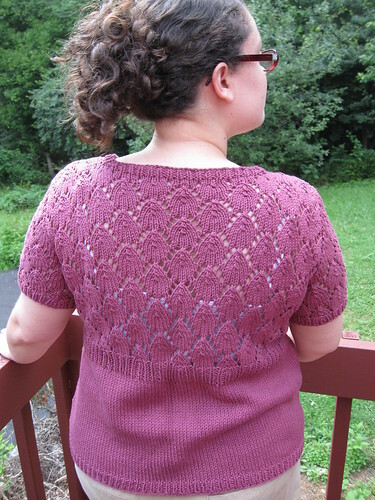 I also finished up one repeat of the lace chart of Clue 4 of the Secret Garden Shawl.